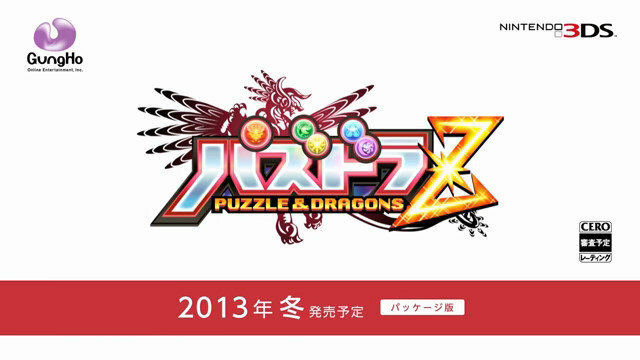 Despite having been downloaded more than a million times in North America, GungHo Online Entertainment’s RPG/puzzle blend Puzzle & Dragons, or Pazudora as it’s more commonly known in its native Japan, is still considered something of a niche title in the Western world. The game combines elements of traditional tile-matching puzzle games such as Puyo Puyo and online favourite Bejeweled with the trading and stat-building elements of classic Japanese RPGs, topped off with a sprinkle of Pokémon-esque companion monsters to collect and trade. The game is currently one of Japan’s most played mobile games and is almost entirely responsible for its makers’ US$763 million of total sales in the first half of 2013 alone, with more than 17 million active players in Japan today. Following on from this success, a 3DS version of the game was recently announced and is due to go on sale on December 12 this year. Reports suggest, however, that the 3DS version will be slightly different in order to protect younger gamers from the microtransaction system that the game has become synonymous with. In Puzzle & Dragons, the player progresses through a series of dungeons in the company of a small troupe of monsters of varying elemental classes that are used to battle against the enemy creatures that appear. The game screen is divided into two: the top half showing an animated representation of stat-based battles based on attack, defence and health points à la traditional JRPGs, and a bottom “puzzle” area filled with coloured gems that must be arranged into lines of three or more to make them disappear. When a line of each particular coloured gem is cleared, the corresponding companion creature is able to attack the on-screen monsters. More busted gems and multiple lines cleared mean more successive attacks, and defeating the dungeon’s monsters rewards the players with experience points and unlocks. Simple. At least to begin with. During the first few encounters, the game is almost too generous, handing out new toys like a tipsy Santa who just came into some cash, and the dungeon’s enemies so weak they’d fall over if stood in front of a desktop fan. But an hour or two in and the game suddenly becomes decidedly tricky. Focused, dedicated players can continue to play for free and will, ultimately, progress, but if GungHo’s first quarter net profits of US$161 million are anything to go by, a great number of people choose to make a few small in-game purchases in order to overcome the hurdles they face. It’s these microtransactions, which many smartphone gamers may have only recently become familiar with through titles such as Jetpack Joyride and Plants Vs. Zombies 2, that are the key to GungHo’s phenomenal financial success. As with PopCap Games’ zombie-tastic tower defence game, microtransactions are usually integrated into free-to-play titles where the player is able to purchase small booster items or exchange real-world money for in-game shortcuts to success. Plants Vs. Zombies 2 seems to have found the sweet spot between challenging entertainment and shameless monetization, and manages to be fun without feeling like the gaming equivalent of a coin-operated peep-show booth, but GungHo’s popular puzzler has been criticised (or perhaps that should be commended?) by industry figures such as game economist Ramin Shokrizade, who commented in an article written for Gamasutra in June this year that Puzzle & Dragons is in fact a “money game” almost flawlessly masquerading as a game of skill, in that it repeatedly puts the player in a bind while dangling the keys to escape behind a semi-transparent pay-wall. But GungHo President and CEO Kazuki Morishita announced yesterday that the Nintendo 3DS version of the game, titled Puzzle & Dragons Z, will be a stand-alone package and cut out the microtransaction system entirely–something that we’re sure many parents who have watched their kids pour their pocket-money into the mobile version of the game will be pleased to hear. The game will also feature a more fleshed-out adventure mode, complete with a legitimate back-story. “The concept this time around is for children to be able to safely enjoy the game,” Morishita said in a statement at a recent promotional event. “They will be able to buy and play the game as a complete package,” he added. Already downloaded some two million times from the App Store and Google Play, there’s no denying that GungHo is onto a winner with Puzzle & Dragons. Whether it will be able to repeat that success when player skill comes before paid upgrades remains to be seen, but the company is aiming to shift a cool million copies of the 3DS port by the end of 2013. Another million kids transfixed by a game of fantasy beasts and magic is a slightly scary thought, but at least this time around they’ll have to learn that success cannot be bought for an additional few hundred yen.